Passport, Visa and other ID photos. ID Photos - What is it? ID Photos Pro 8 it’s a professional software designed for quick and automatic ID photos processing (e.g. Passport, Visa etc.) in compliance with ICAO and local regulations. 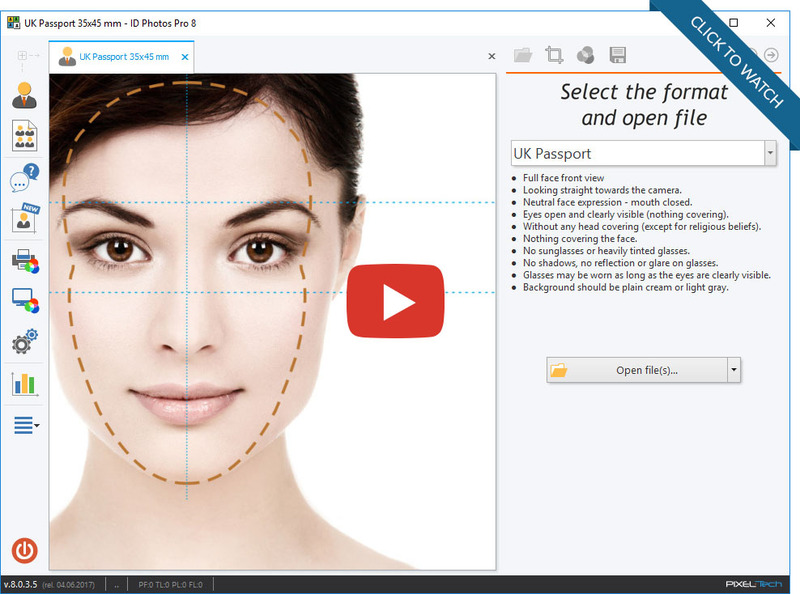 ID Photos Pro 8 is one of the few software approved for France’s National ePhoto Program. Operates with Wacom tablets to capture the signature required in the ePhoto application process. The ePhoto feature requires an additional GIE registration fee (payment and activation through Tetenal sarl). ID Photos takes full advantage of Windows Color Management. Supports both manual corrections and ICC profiling with print colors “soft proofing”. As from version 8.3, ID Photos Pro gained new functions supporting GDPR compliance, including dedicated GDPR Assistant. Assistant regularly controls and recommends optimal software security settings. ID Photos Pro is a locally installed software. It does not automatically sent photos and process images for the purpose of identyfying a natural person. Furthermore, it does not record the so called biometric points. Using ID Photos Pro is secure and does not require obtaining customer’s consent to use it to process his photos. With settings recommended by the GDPR Assistant, it is fully compliant with the provisions of the Regulation. Secured Cloud Storage (SCS) is the new GDPR-compliant service dedicated to ID Photos Pro, for a quick transfer of all ID formats to the client. It allows to avoid definitely less secure and disputable, in terms of GDPR, options like sending photos via email or saving them on pendrives or CDs. Sending a photo to SCS generates a unique secure Photo Code with which the client can download their image on their own computer or even smartphone. In addition, SCS can deliver a UK ePassport format with the so called ”Photo Code”, allowing to apply for a British passport directly on the government page gov.uk. Here you can find relevant technical information: supported ID formats list, hardware requirements and history of released updates. *Windows XP (Service Pack 3) is supported conditionally, however we cannot guarantee stability and we cannot provide full support for this Windows version. [+] Secure Cloud Storage now with optional cutting lines, cutting margin. [!] Fixed a bug when ICC file without description field could lead to an error. [!] Fixed a bug related to logging into the program (in some cases logging was possible without providing any password). [+] Secured Photo Storage - reduced time of establishing connecting with the server, speeded up photos uploading. [+] Secured Cloud Storage service for quick GDPR-compliant transfer of any digital ID photo to the customer. • GDPR Assistant, which regularly controls and recommends optimal software security settings. • Automatic deletion of photos from the Archive after a configured time. • Automatic deletion of photos from the Repository after a configured time. • Anonymization of statistical data after a configured time. • Password-protected access to the software. • Protection of sensitive functions in the software with a User or Administrator password. • Changed the "Customer Name" field (various places in the software) to the more generic "Order ID". • Updated License Agreement (new GDPR section). • Integrated online validation of photos on HMPO gov.uk website. • SCS printout with photos that are compliant with the classic passport format (29-34mm head size). [!] Updated France ePhoto code generator (eliminated ‘O’ and ‘I’ from the code). [+] Updated format: CH Passport (digital) 1440x1980px. • New Zealand - Visa (digital) 1500x200px. 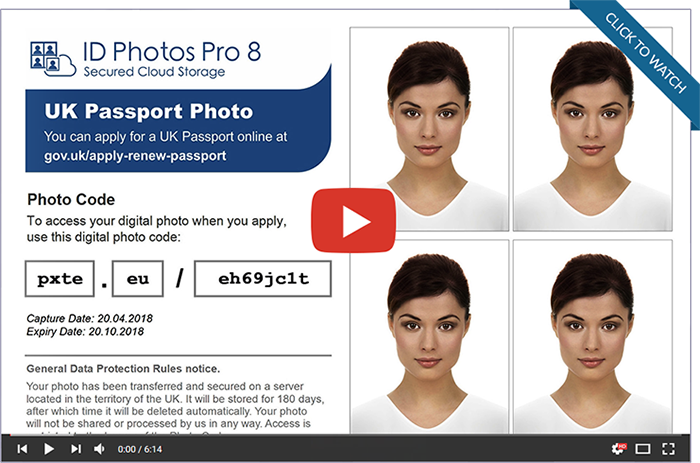 • Optional Secured Cloud Storage service that brings the "Photo Code" feature for the UK ePassport. • USA - Firearm Owner's ID (FOID)(Illinoise State) 2x2"
[!] Bug fix for a problem with default color corrections. • USA - Visa 2x2"
[+] Reduced application size and faster startup. [+] Changed "Obsolete" status to more relevant "OutOfDate" in the language translation tool. [!] Updated messages related to the French ePhoto format. [!] Updated French ePhoto templates. [!] Fixed application's icon in a system tray. [!] Fixed QR codes generated by the application. [!] Fixed Camera Tethering feature. • Saudi Arabia - Visa 2x2"
• Email settings - 'TLS/SSL' option changed to more relevant “Use SSL”. • Gamma correction renamed to "Brightness"
[+] Certificate of compliance ICAO for every passport photo. [+] Over 100 minor changes. [!] New provider of timestamp certificate that is used to sign our software. [!] A few tweaks to get the software ready for upcoming version Pro 8! • US - Visa 2x2"
[!] Fixed bug related to export function for Passport and Visa of Iran. [!] ePhoto – Fixed bug related to truncated ePhoto number on confirmation prints. [!] ePhoto - Fixed bug related to missing ePhoto number on confirmation prints. • Certificate of Compliance with ICAO and local regulations for all biometric passports. • Option to show/hide face cropping mask on prints. • Added option to keep original background size. [!] Removed layout templates that were duplicated with/without face mask. [!] Updated libraries from third part companies. [+] Translation into Arabic-Jordan language. [+] Configurable step in color corrections (5 as default, like in former versions of the software). [+] File naming options extended with the keyword (useful for “Export” and “Minilab” printers). [!] Fixed security leak that allows to get access to printers’ configuration without entering a password (if any was set up in the settings). [!] Fixed bug related to the Reset button in the Monitor Calibration function. [!] Protection against unexpected errors that could occur during processing pictures in a group mode. [!] Fixed bug that rarely occurred when the main window was resized. [!] Fixed window’s title in the License Activation form. • Added format "France - ePhoto". • Safe upload a photo and a signature to the GIE server. • Support for Wacom and other pen tables. • Fully customizable receipt templates. • ePhoto requires Windows 7 or later. [!] Update of the CD Burning library (support for new media types). [!] Bug fix for phenomenon of printing pages without visible photos. [+] Compatibility with Windows 10. • Color calibration available for any combination of printer and format. • Printer properties configurable and persistant for each format (in former versions the default ones from Windows were in use). • "Print" button starts printing instantly without any additional steps or dialog windows. • Next to the "Print" button the "Printer Properties" button available. [+] Drag&Drop photo to the page automatically selects the page to print. • Bug related to problem with running the Monitor Calibration function in some situations. • Bug related to Watched Folder/WiFi Folder that caused - in some situations - both the freezing of the application and 100% CPU load. • Israel - Passport 2x2"
• Argentina - Passport 1.5x1.5"
[!] Fixed bug related to Selective Adjustment Tool in a retouch function. [+] Left & right mouse buttons supported on all color correction track-bars. [+] Changed button’s title from “Nothing” to “OK” in the “What next?” message after exporting/burning/printing. [+] Added an option "Next Photo" in the "What next?" message after exporting/printing. [+] Pre-resize of unreasonably large photos (e.g. from Nikon D800) to max. 3500px length images (just right for printouts up to 30 cm at 300 dpi). Pre-resizing prevents out-of-memory issues and highly improves performance. [!] Fixed a bug related to not refreshing screen in the layout window after changing color corrections of the photo. [!] Fixed a bug related to printing B&W face-mask (should be red) for B&W photos. [!] Fixed a bug related to saving saturation correction. [!] Fixed bug related to message "\\Device\.... is unavailable"
[+] Export, burn on CD/DVD and e-mail with an option that allows you to export a full-size photo or a processed one (cropped). [+] Fast launching option (keeps the software in the system tray instead of closing it). • Limit to run only one instance of the application at the same time. • Fixed a bug related to run the software without a visible window. • Changed the system of removable drives' watcher to eliminate the problem of freezing application when CD/DVD is unavailable. • Fixed a bug related to the action selection message box after CD/DVD burning. [!] Improvements in face width (ears) detection (increased head size on photos in Dutch formats). • Lastest version of IdPhotos Pro 4. • Latest version of IdPhotos 2008. More technical details about ID Photos software can be found in our FAQ. ID Photos Pro 8 license comes with a one year* Subscription for free technical support and software updates. The Subscription can easily be renewed yet optional. Every license we provide is perpetual – your product will never stop working unless you install a version that has been released after your Subscription has expired. If your Subscription is expired you can no longer download and install updates. We recommend to keep your system updated to the latest version at all times because we regularly introduce bug fixes, new ID formats and new features. * In our offer you can also find ID Photos Pro 8 software with 2 or 3 years Subscriptions.